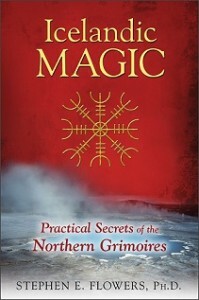 Not too long ago I finished reading “Icelandic Magic: Practical Secrets of the Northern Grimoires” by Stephen E. Flowers, Ph.D. and it was a truly fascinating work, a wonderful blend of scholarly and practical. (For those of you who consider working magic practical.) “Icelandic Magic” is divided into two books. The first part is history and basics of Icelandic magic and the second part is referred to as “Gray-Skin”, which is a reference to a famous magical book of semi-legend and in this case a book of magic in traditional Icelandic form. The history of magic in Iceland is interesting as their magical and religious interactions with the influx of Christianity were more intermingling than in other regions. It makes their magical practice come across as a pragmatic, get the job done, kind of school. The first section also discusses lore and legends of Iceland’s magicians, which I loved! I adore reading about magic users and this was hands down my favorite part of the book for me. Before you get into the nitty gritty of the second half of the book, Flowers gives you a rundown of equipment you’ll probably want or need and the basic ritual format. Then, if you’re ready, willing, and able you can venture forth with workings. These cover the categories: Wisdom, Power, Protection, Control, Prosperity, Love, Reception of Luck and Release of Blessings, and Sleep Magic. The groundwork laid down leading up to this point makes the workings easy to understand if not simple to master. You’ll also find useful appendices that include runes and magical letters, the names of Odin (hint, there are many), and the “Our Father” prayer in Latin. “Icelandic Magic” is great for those interesting in learning about magical theories, history, and/or practice!